Over the past year, we Atari owners have been much like blind men stumbling along the edge of a cliff. We don't know where we're going, we don't know how we'll get there, and we don't know when we might find ourselves falling into oblivion. We wonder what Atari is going to do next and speculate on how they will recover from their current slump. We wonder even if there is a slump. It's difficult to know whether the grim atmosphere of the Atari community is the result a few individuals' incessant griping—a matter of perception rather than reality—or whether Atari has truly betrayed our trust, has shaken out our wallets with a friendly grin then walked away covertly smirking, leaving us to listen to the I-told-you-so's of IBM, Commodore and Apple owners. Atari products are continuing to disappear from store shelves. Major magazines are slashing Atari coverage from their pages. The lack of machines for the Christmas season has forced many once-loyal Atari dealers to bring other computer brands into their stores. We have to eat, they say. And to eat they must sell computers. I suspect that the coming year will be a critical one for Atari, a year in which they will have to struggle not only to remain on the cutting edge of computer technology, but also to regain the respect and confidence of their customers and dealers. But I've got this feeling. Probably this feeling's origin is in Atari's hints of dramatic announcements for the winter COMDEX. Atari representatives have indicated that there may be (coy, no?) some stunning new products represented at that show, and the rumors of Atari's reserving more than their usual square footage of display space seem to imply that something is waiting backstage ready to spring into the limelight. "Wait and see," Atari says, giggling and winking. "You're going to be surprised!" As you've probably heard, the most likely of the surprises is an ST laptop. Atari, of course, has adherred to their new "closed-mouth" policy, so there's no official word, no photographs, no technical specifications. Just a rumor. But whether an ST laptop will give Atari an "A" in the public's gradebook will depend to a great extent upon the price. Laptop computers, these days, are as ubiquitous as soiled diapers in a hospital nursery. Atari will have to differentiate its product from the others—and a low price may be the "feature" that will catch the public's eye. A high-end laptop computer costs over $2,000 and includes such features as a built-in hard disk; long-lasting, rechargeable battery pack; online software (word processors and telecommunications programs are typical); a high-quality display; and, of course, lots of RAM. If Atari can come up with a high-end product at a low-end price, it may just get that "A," otherwise the ST laptop will be buried among its competitors. Another product from the rumor mills (one that has in fact already been shown at computer shows around the world) is Atari's CD-ROM player. Just as the ST's MIDI compatibility attracted musicians by the score, so would the CD-ROM player draw the attention of schools, businesses and any type of organization that could take advantage of the huge storage space and fast data retrieval made possible by the CD technology. CD-ROMs in the home? Many people scoff at that suggestion, saying that the average home can't take advantage of this new technology. The home CD-ROM market, they say, will be made up only of computer "fanatics": people who will buy any computer related gadget. However, the fact is that, if Atari can bring the CD-ROM player to market at the price they'd like, the player along with the CD version of the Grolier's encyclopedia won't cost much more (maybe even less) than the encyclopedia alone in its conventional book form. Sounds like a bargain to me, especially when you consider that every significant word in the entire encyclopedia has been indexed so as to allow the almost instant location of any subject—and all this data on one thin CD. Once CD-ROMs do get into the homes, can you even imagine the possibilities for game software? It almost staggers the imagination. Another possible "surprise" from Atari is a 68000-based game machine. What effect will this product have on the morale of the ST community? The answer to that is, I think, obvious—and strange. Because Atarians like to whine about Atari's game-machine image, it seems ironic that ST game software is usually at the top of the Atari bestseller lists. Pssst. Listen up. We vote with our dollars, folks, and you can be sure that Atari, as well as all its third-party developers, have not overlooked the fact that more copies of Dungeon Master have been sold than any other piece of ST software. Couple that with the fact that the new age of video games is upon us (although many claim the new age will fade just as quickly as the old one did), and a state-of-the-art videogame system from Atari shouldn't come as a surprise to anyone. Someone needs to give Nintendo serious competition. And who else should that be but the deposed king of the video game, now back to reclaim its crown? There is, ready and waiting to be burned into cartridges, a wealth of high-quality games for the ST. Of course, games like Dungeon Master will not, due to their large size, be able to make the transition from disk to cartridge And you can't (even though Atari has tried it with the XE Game System) have a disk drive with a game machine. That makes the system a computer, and the average guy looking for a Christmas present for his kids is not going to buy a game machine unless it looks like a game machine. Imagine that. People not buying Ataris because they make them think of computers. What a world. That there is currently a good market for videogame machines there can be no doubt. Is the release, then, of a new, state-of-the-art game system a good move for Atari? The answer to that depends upon the longevity of the current videogame craze. Every company needs to look to the long-term. (Ask Coleco; they'll tell you.) If there is no future in video games, then perhaps Atari should focus its energies elsewhere. But that's a big "if?" We have to remember that (game technology has improved immensely over the past few years. During the old videogame craze, people were buying game machines in an effort to bring the coin arcades into their home. However, machines like Atari's 2600, the top-selling game system at the time, looked pretty pathetic compared with the high-tech wonders that were sucking down quarters at the local arcade. People bought disappointment for their bucks and the industry suffered for it. Today's video-game machines truly rival their arcade counterparts. If you haven't seen a Nintendo in action, you owe it to yourself to take a look. These are sophisticated graphics powerhouses, and the games are every bit as addicting and exciting as their coin-operated cousins. The new game cartridges sport 128K of ROM—plenty of room for complex, long-lasting games. And greater game complexity has given rise to yet other advances. Many of the new video-game cartridges allow players to save their progress in a game at the end of a game-playing session, so they don't have to start over the next time they sit down to play. Some of the cartridges accomplish this with a built-in battery pack. Others use a clever password system: When the player has finished a session of gameplay, the values of the game's "variables" (the player's position, the items he may be carrying, his scores, etc.) are converted into a coded string of characters. When the player comes back to play again, all he has to do is enter this string of characters, and he's back where he left off. All of these advances—improved graphics, more complex games, game-saving features (and others)—mean that when you buy a videogame system today, you're not buying disappointment. That goes a long way toward assuring a good future for video-gamers. 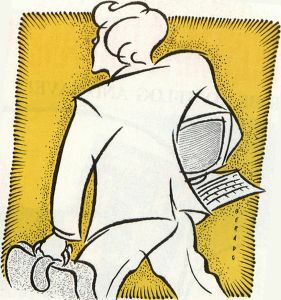 Will an ST laptop, a CD-ROM player and a 6800-based game system be Atari's life-lines for 1989? Do these products even exist? No one outside of Atari knows for sure. But I've got this feeling.